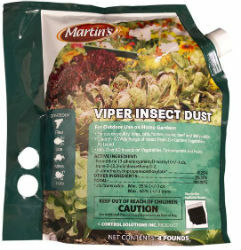 Controls insects on vegetables, flowers and fruits in the garden. Use Sites: flowers, vegetables, fruit, garden, trees, dust bag, cattle, cows, livestock, horses, dogs, swine, pigs, dairy. Effective Against: Flies, horn flies, face flies, lice, Northern fowl mites, fleas, ticks, beetles, aphids, stink bug, leafminers, armyworms, and cutworms.